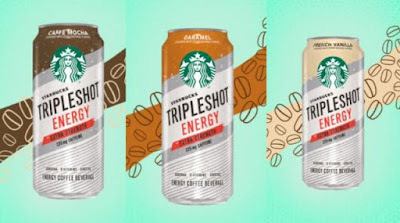 Seeking a bigger piece of the energy drink market, Starbucks introduces new Starbucks Tripleshot Energy in 15 fl-oz cans. The drink feature Starbucks coffee fortified with vitamin B, ginseng, and guarana, sweetened with sugar and monk fruit. Each can of the "energy coffee beverage" contains 225 mg of caffeine (compared to 145 mg in their 15 fl-oz Doubleshot Energy drinks). Starbucks Tripleshot Energy comes in three flavors at launch: Caramel, Caffe Mocha, and French Vanilla. The suggested price is $2.99 per can. The Tripleshot name appears to be a play on the brand's Doubleshot beverage line, which includes energy drinks, espresso drinks, protein drinks, and smoothies.